big home by the ocean! And although I haven't done the research, I am pretty sure most of us have been dreaming of a home by the beach, especially before, during and after those long-awaited summer vacations. So what makes a property by the ocean or the sea so enticing? It has a somehow romantic and nonchalant feel to it. I will often fabricate the following perfect vision in my head. I would wake up early (although I am not an early riser), greet the sun, watching it rise above the ocean, put on my running shoes and run peacefully along the coastline (although I am not much of a sports type either). Almost everyone has this yearning for the ocean - perhaps it is the feeling of freedom and tranquillity that it carries, or maybe it just brings back long-forgotten childhood memories filled with sea, salt and blue skies. Whatever it is, there must be a reason why in 2017, 2.48 million of Americans planned on buying a second vacation home (source: Statista). If you are seriously considering shifting to a beach lifestyle, let's cover the types of properties and the pros and cons of living by the beach. From cute wooden cottages to beach houses to grand estates, there are various types of oceanfront property out there. 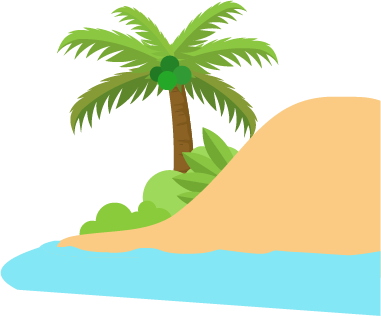 Choosing a specific type of beach property depends on your taste, how extrovert you are (whether you are planning to turn weekends into mini-weddings, with a lot of guests) and, of course, your budget. With its opulence of ocean fronts, North Carolina’s landscape and geographical positioning will please even the most fickle tastes. If you are looking to buy estate property by the ocean, then you surely mean business. Estate oceanfront homes are usually more than 6000 square feet in size and come with acres of land with it. They are perfect for those of you who do not like to stay alone for too long, as you could organize beautiful family gatherings, business meetings and social events that you will discuss for weeks after! What makes oceanfront estate houses attractive are the few acres private oceanfront that comes with it. You can entertain your friends and relatives by enjoying long days on the beach without having to worry about private space. 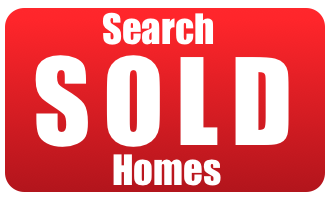 Estate homes usually feature at least five bedrooms, six or more bathrooms and three or more living areas. They come equipped with amenities such as private gym, game or study room, formal and informal dining rooms and an elevator. The average price of estate homes will run about $2 million. You will not need any of the modern-day sleeping sound gadgets with this home, as the ocean waves will lull you to sleep every night. You will step from your front deck on the beach and watch the sunset with your friends. 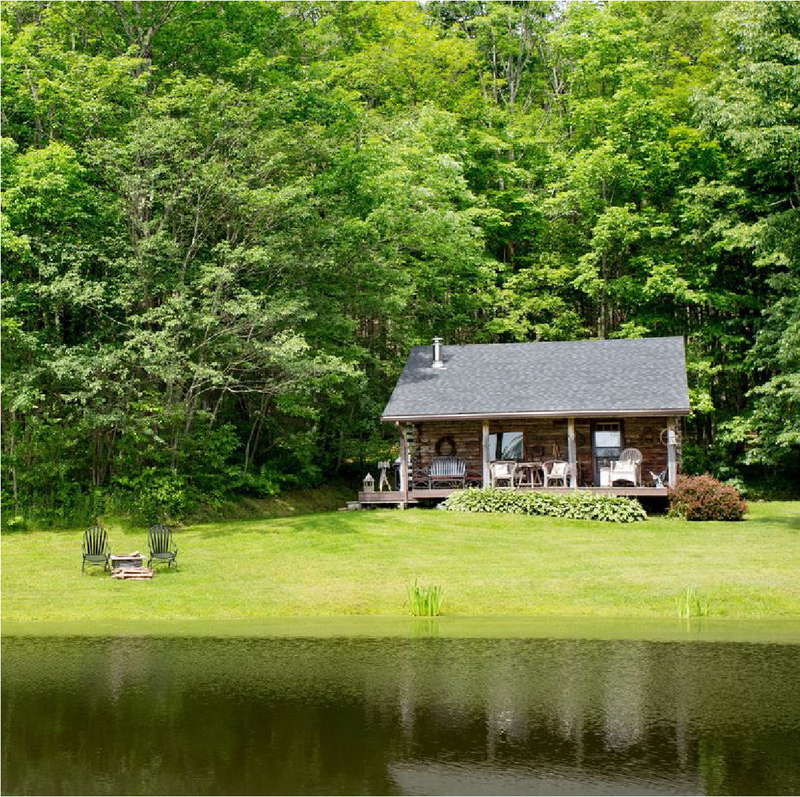 If you like your home to be on the waterfront but find the ocean to be somehow intimidating, then the option of a small cottage or a log cabin with a private pond would suit you best. These types of properties are usually isolated and private, so they are perfect for a lazy summer of quiet bliss, away from tourists and noisy neighbours. Small log cabins will usually fit one family, featuring one to two bedrooms, a large living area with kitchen and one or two bathrooms. Keep in mind though that they will require more upkeep than a regular modern home, such as some refinishing work every three years. The refinishing process will require corncob blasting, which gives the exterior walls a new life and will roughly cost about $10 000. Average price for log cabins with private ponds would range between $175 000 and $350 000, depending on the size, location and amenities. With a size of up to 1500 square feet at the most, this type of property is a perfect fit for families who want to enjoy some quality time bonding over fun barbeque nights on the porch and fishing for bass in the pond. If you are looking for some privacy but at the same time do not want to be completely isolated from the rest of the world, then an oceanfront house within a luxury community might be the best bet for you. The private community will provide you with the sense of security you need for you and your family, as well as some extra goodies. Luxury communities often hire a third-party security company to ensure the peace of mind and safety of the community residents. Luxury communities come with many amenities, such as a well-structured infrastructure, acres of green areas and parks with playgrounds for the children. They will often have swimming complexes and golf clubs, lighted jogging and biking trails, 24/7 security etc. The improvement of social life is something many luxury communities strive for through the organization of various movie and BBQ nights. 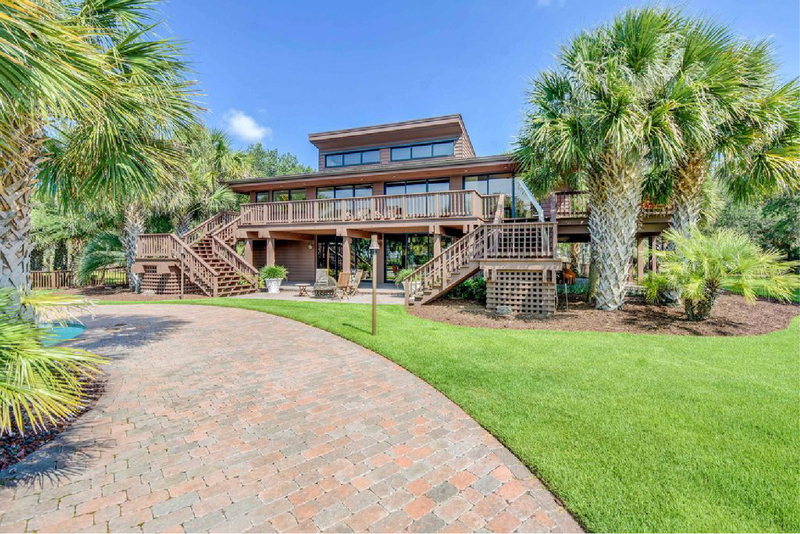 The average price of oceanfront property in a luxury community, such as Figure Eight Island in North Carolina is between $2 million and $3 million. All in all, living in a luxury community will give you the best of both worlds. You will still be getting your privacy and your private oceanfront estate, but at the same time will be able to mingle with neighbours and enjoy the advantages of a well-structured community. With a minimum size of 8000 square feet, an average of 6 to 7 bedrooms, as many bathrooms, breakfast rooms, dining halls, playrooms and whatever other modern amenities the owner desires, mansions are a dream come true. No matter whether this is a vacation home, investment or full-time residential property, owning a mansion, where you walk right outside onto the beach will represent the highest level of luxury to many. One of the newest rising trends in 2018 in the luxury real estate market is the development of various health and wellness amenities. In fact, a recent survey of Americans with annual income over $75 000 found that 25% of them are interested in living in a wellness community, away from the urban noise. Swimming pools and private gyms are considered some of the must-have amenities by potential buyers. 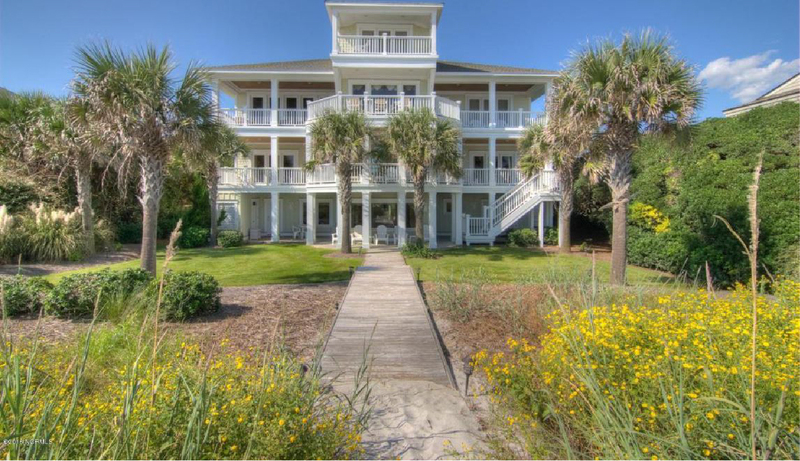 The average price of an oceanfront mansion in North Carolina is $4 to $5 million. Did you know that the biggest mansion in America is situated in North Carolina? The Biltmore Mansion Built by George Washington Vanderbilt II in 1895, a size of 175 000 square feet and 250 rooms, it is the largest privately owned home in the USA. With over 300 miles of beaches, North Carolina will amaze you with its diversity and spectacular views. Nothing beats the thought of swinging peacefully on a hammock on your front porch, watching the sunset create a colourful path over the ocean while sipping yourself some white wine. Or, if you are feeling adventurous, you could sail away with your boat or easily rent one and enjoy North Carolina's pristine landscape from the sea. You might as well say that I am pointing the obvious, but did you know that sea air is full of negative ions, which help you better absorb oxygen? Have you ever wondered why you always feel super energized and happy after vacation by the sea? Apart from the psychological explanation having to do with spending some great time away from your boss and dull office desk, there is also the scientific one. The negative ions in the air will balance out the levels of serotonin in your brain, the chemical which is linked to well-being and happiness. All of the above, together with the sound of waves, which are proven to have a therapeutic effect on your brain, will help you enjoy better sleep at night. The sunlight helps produce more endorphins - the chemicals that contribute to a sense of well-being and happiness. By getting enough sunshine, you will also become healthier by getting your daily dose of Vitamin D, naturally. Vitamin D will strengthen your bone structure and immune system, help you be more energized and alert, and according to some studies, may even prevent you from feeling down and depressed. Vitamin D deficiency is one of the most common nutrient deficiencies in the world, in fact, a study by NCBI from 2011 states that around 42% of Americans are deficient in vitamin D. So get your flip-flops and sunscreen ready and indulge for hours on the beach, obtaining your daily shot of joy and relaxation. It is no surprise that there is even a name for using sea water to improve your health condition - it is called ‘thalassotherapy’. OK, I might have become over-excited here, but there is a reason why Ancient Greeks used to bathe in tubs full of sea-water. It has been proven that sea water will help with reducing inflammation and help heal your wounds faster, as well as hydrate your skin. The magnesium found in sea-water will hydrate and better the overall appearance of your skin, and its calming effects on your nerve system will help you relax. Sailing, surfing, kayaking, diving, Paraplanning - you name it. There are plenty of ways to be entertained and stay fit at the same time. You could set sail in Edenton, which is named one of "America's prettiest towns". The vibrant landscape and marvellous nature of North Carolina have a lot in store for you. You could go horse riding on the beach for a change, or just go hiking in the Appalachian Mountains. Whatever you choose, get ready to get your blood flowing and muscles growing. you must consider both sides of the coin. Enjoying the tranquility of living by the ocean comes at a specific cost. Having a house with any waterfront is more expensive to maintain than any other type of property. It is mainly because of the humidity that inevitably comes with property by the ocean. It will deteriorate the exterior, which you will need to, occasionally, get fixed. The dampness can also have a negative impact on furniture and the house's structure. If you want to extend the life of your home’s interior and exterior, you will need to undertake some measures to maintain humidity at low levels, which will cost you some time and money. 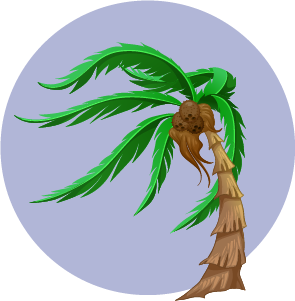 One measure is to monitor the humidity levels at your home, which, ideally, will need to be between 35% and 50%. Consider also investing in stainless steel locks to withstand corrosion from salty air. Unless you are living in a luxury community with a few other houses to exchange drinks with on long summer nights, most oceanfront homes tend to be quite secluded from the rest. It can be an issue if this is your vacation home, as there will be no one around in case someone decides to visit uninvited. 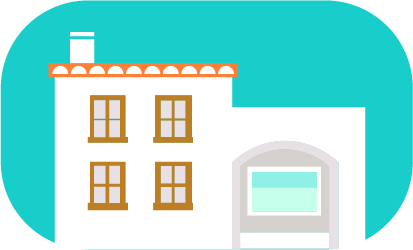 The doors and windows facing the ocean can be more volatile towards burglaries. Therefore it is of utmost importance to have a sound security system on, especially while you are away. It is a well-known fact that water attracts not only humans but also mosquitos and other insects, which can be pretty annoying. Mosquitos prefer damp environments, although their breeding rate may vary depending on the conditions, such as breeze intensity and others. If you live by the sea, you will need to gather some patience and stock up on anti-mosquito spray or any mosquito repellent, as they can ruin your good night's sleep. During storms and spring tides, rising sea levels can dampen the coastline and have a devastating impact on entire communities. Presumably, living in paradise comes with a risk, a risk of the ocean damaging your home, which inevitably will require a higher insurance premium, and, in some cases, flooding insurance. the higher its price would be. WHY AM I BUYING THE SECOND-HOME? Are you buying it as a long-term investment to generate a steady income in the future, or you would just like to spend your vacations in it for a few weeks every year? 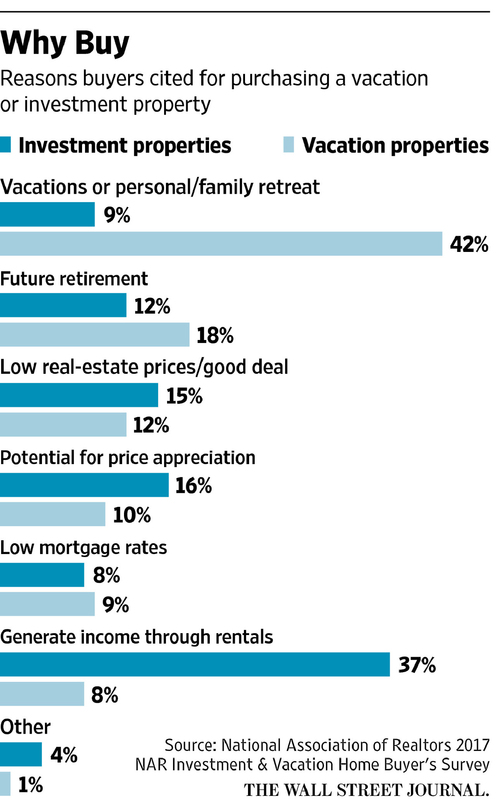 Below is a short study by the Wall Street Journal for some of the reasons Americans give to buying a vacation property, where it shows that a good 37% of vacation owners are planning to generate income from it. 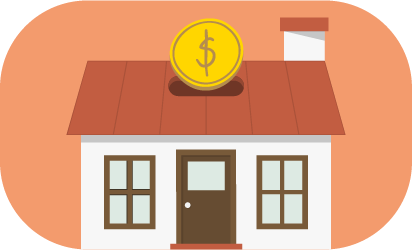 WHAT IS THE MORTGAGE COST? If you are planning to take a mortgage for a second home, keep in mind the following - the interest rate for buying a vacation property is almost always higher than the one for your primary property. Is the timing right for this type of investment? 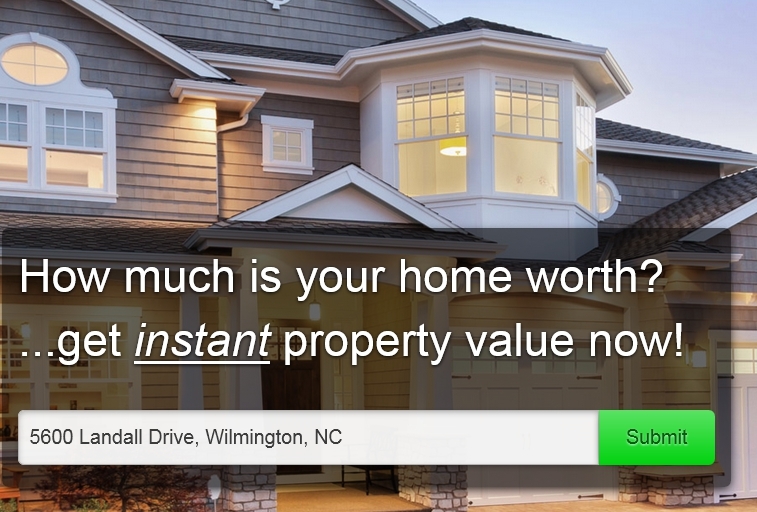 What is the average price of a property in your desired area right now? Is there a possibility of having that price soar or fall in the near future? According to Zillow's home value index, the value of homes in North Carolina has gone up with 6.2% in 2017 and is predicted to rise by another 3.1% next year. So this might well be the perfect time for you to invest in a vacation home after all. WHAT ARE MY TRUE COSTS? Consider the cost beyond the regular bills, such as cable and electricity. As with any other business, you will have to invest in marketing and advertising, perhaps hiring a person to deal with reservations, as well as commissions to third-party sites and travel agencies. Make sure you have adequately calculated your Adjusted Gross Income (AGI). 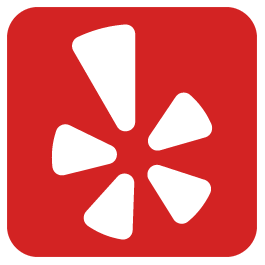 If you are not sure how to do it, hire a professional. As long your AGI is over $150 000, you can definitely plunge deep into the ocean and buy it. DO I HAVE TIME TO MAINTAIN MY PROPERTY? Be prepared to face real people with real needs, questions and doubts during the active season. Be prepared to write and reply emails daily, and manage the holidays of your customers. It means good income and a lot of work. HOW LONG IS THE TOURIST SEASON IN THE AREA? 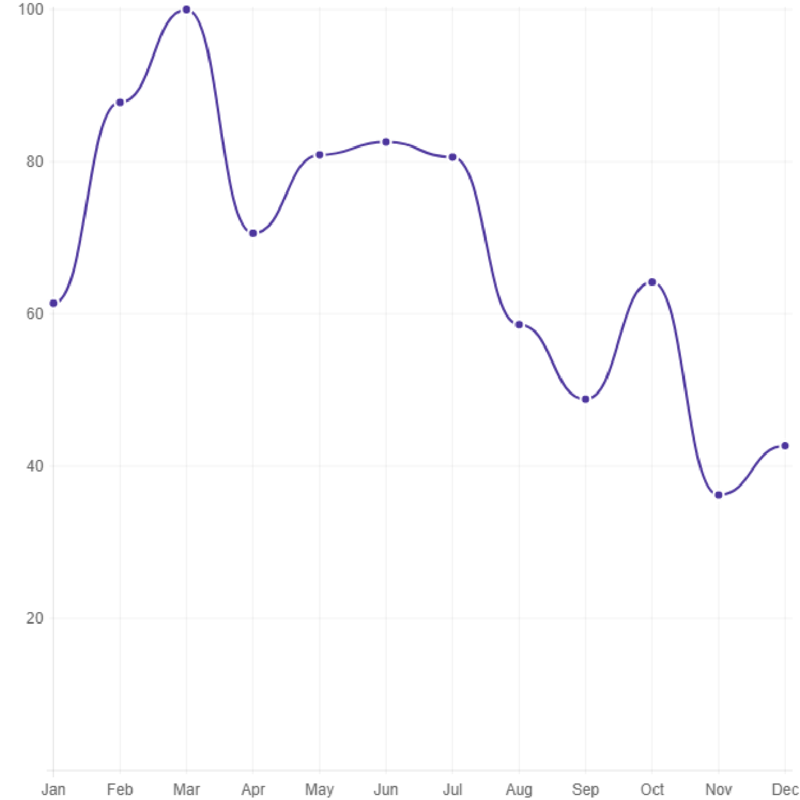 North Carolina has a pretty long tourist season with busiest months being February, June and September. Take a look at the following graph by Champion Traveller based on Google searches made by travellers to North Carolina. Shall we consider oceanfront houses to be a good investment? 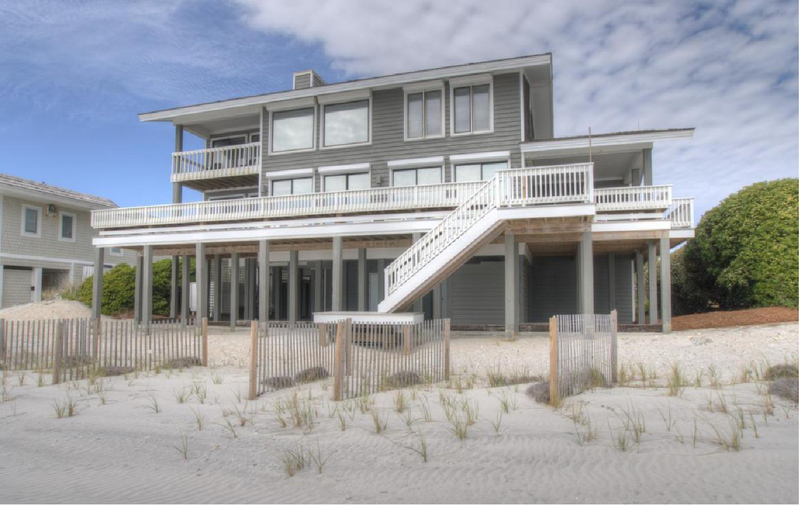 There is always a limited supply of oceanfront houses, and the demand for them is still higher. Therefore their value will stay higher for longer.